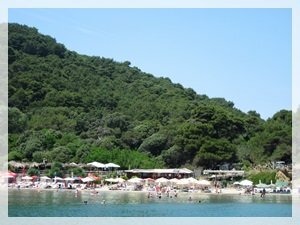 Sunj beach is located on the island of Lopud (Elaphite islands) in the vicinity of Dubrovnik. It is surrounded by a rich Mediterranean forest. This is a beautiful sandy and shallow beach ideal for everyone: families with small children, young people, sport fans and older people. There are two bars on site serving drinks and snack food. Deckchairs and parasols are available for rent. The beach is accessible by a 20 minutes walk or an electric car ride (price 10 HRK) from the port of Lopud. There is a naturist section of the beach (left section of the beach). 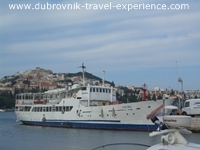 There is a regular boat service from Gruz port to the Lopud island (40 minutes boat ride). Find out sailing timetable and boat ticket prices! The Jadrolinija's boat will drop you off at the port of Lopud. Sunj beach is located on the opposite side of the island. You must take the path across the island to reach this beautiful sandy beach. If you arrive to Gruz port by bus get off at the bus stop near Department store 'Srdj'. Embarkation point of the boat is just 2 minutes away. If you prefer to take an organized boat tour there is a range of them for those wanting to visit Elaphite islands. You can choose from boat tours, sea kayaking tours or private sailing boat trip. FROM PLOCE: Take bus no.8. FROM OLD TOWN/PILE: Take buses no.1A, no.1B, no.3 or no.8. FROM MONTOVJERNA: Take bus no.7. FROM LAPAD/BABIN KUK: Take bus no.7.